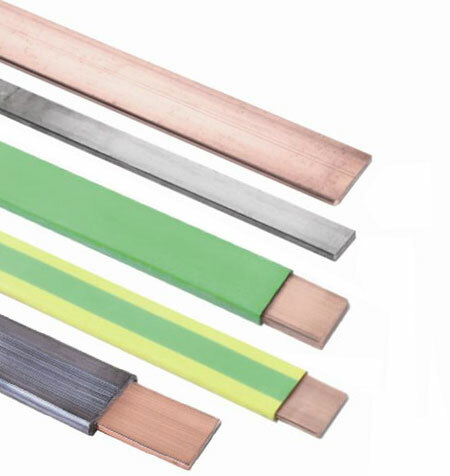 Copper earth tape forms an essential component of earthing and lightning protection systems - bare copper, LSF, PVC and green/yellow insulated copper earth tapes are available. Aluminium tapes are also available with optional coloured PVC covering. Copper earth tapes are to BS EN 13601 (formerly BS 1432) - T&D can produce custom embossed copper earth tapes to local DNO specification including Western Power Distribution (formerly Central Networks), UKPN (formerly EDF Energy) Northern Powergrid and Scottish Power. Custom embosssed copper earth tape for earthing high voltage National Grid substations is available from stock. T&D can recommend earthing contractors to provide a complete high voltage substation earthing installation including switching mat installation, major and minor remodelling of substation earth grids. T&D UK distribute an extensive range of earthing tape and conductors including bare copper tape, PVC insulated copper and aluminium earth tape, LSF insulated copper earth tape, lead covered copper earth tapes and hard drawn copper bar.